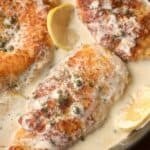 Creamy Lemon Chicken Piccata is the perfect easy dinner. One of my family’s favorite meals! I love easy dinner ideas like this Lemon Chicken Piccata or Chinese Chow Mein! It’s Monday….again. Are any of you fans of “The Bachelor”, the reality TV Show? My mom really hates that I watch that “garbage” as she calls it. But I will admit that it makes my Monday nights a lot more entertaining. And when the show is on a break, like right now, I don’t have much to look forward to on the dreaded Monday. My parents were in town a few weeks ago and took my husband and me to dinner at Brio. Have you tried that place?! The food was amazing. I ordered the lobster ravioli, which was fantastic, and my mom ordered the Chicken Limone. It was basically chicken piccata served over mashed potatoes (instead of the traditional angel hair pasta) with roasted veggies on the side. As soon as I had my first bite I knew I wanted to recreate it for you guys. 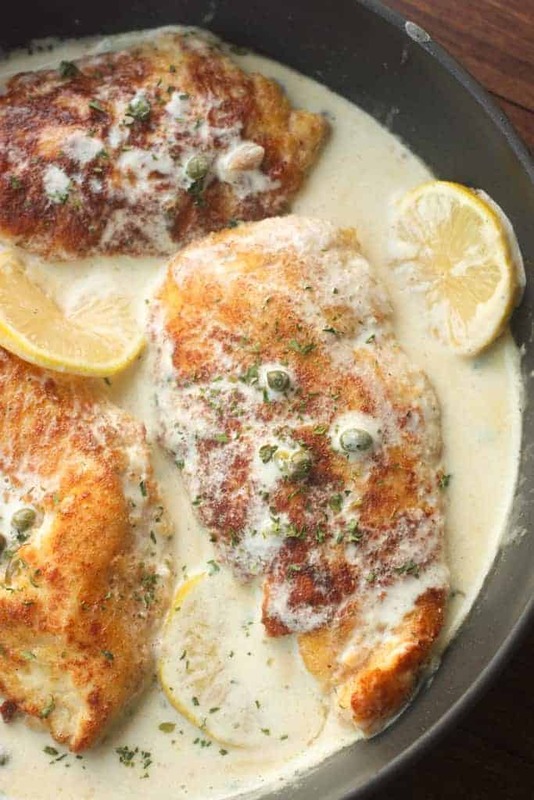 Creamy Lemon Chicken Piccata is the perfect easy dinner. One of my family's favorite meals! Slice the chicken breasts in half horizontally ("butterfly" cutting them) so that you're left with 4 thin chicken breasts. Season with salt and pepper. Beat the egg in a shallow bowl with 1 tablespoon of water. Add the flour to another shallow bowl, and the breadcrumbs to a third shallow bowl. Coat the chicken on both sides in the flour, then egg wash, and then breadcrumbs. Heat 2 tablespoons butter and 2 tablespoons of oil in a large skillet over medium high heat. Add the chicken and cook for about 3 minutes on each side, or until cooked through. Set aside onto a plate. Reduce heat to medium low. Add chicken broth, cream, juice from both lemons, and capers. Season with salt and pepper if needed. Allow the sauce to cook and bubble for about 3-5 minutes. 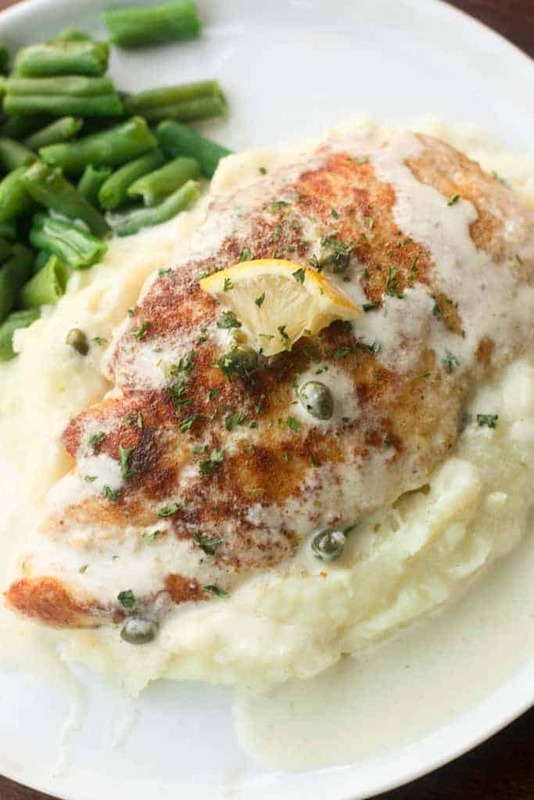 Serve the chicken over mashed potatoes or hot cooked pasta and spoon the sauce on top. Serve with Roasted Vegetables, or steamed broccoli or green beans. This is MY FAVORITE recipe I have cooked from this site! Super easy and beyond yummy! I loved the brine from the capers and the lemon together. My whole family loved it! Thanks so much Beckie! Love to hear that! Omg!!!!! I’ve never cooked with Cappers, and this recipe was simply easy and amazing. My one year old loved the sauce over the mashed potatoes, and did my super picky 8 year old. Can’t thank enough. Total win when your picky eaters approve! Thanks so much for sharing Claudia!! Love this recipe! 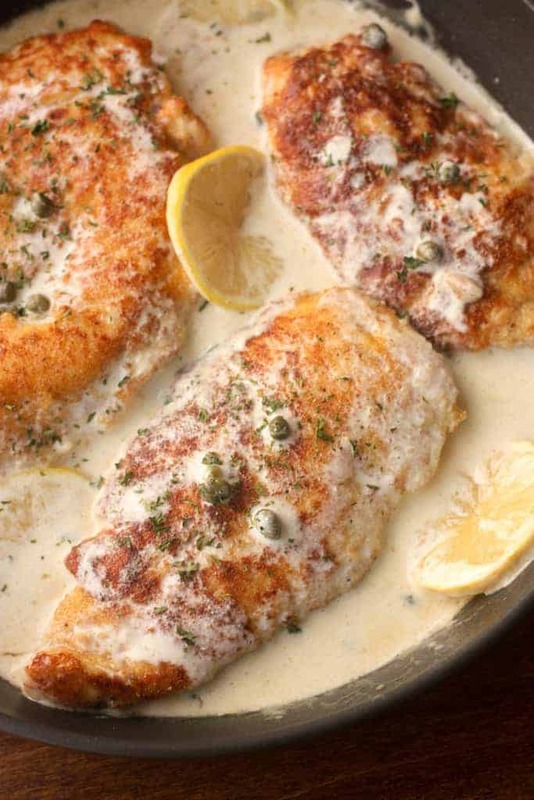 I’ve tried 4-5 creamy lemony chicken piccata dishes and were nothing to write about. I followed your recipe exactly… especially important the little bit of water in the egg so the end result doesn’t leave your coating falling off. I’ve now made this twice and learned that my family like the juice of one lemon versus too. An easy and delicious recipe which I have shared with many friends as I posted the result on my FB page. It’s definitely a staple for my family. I am so glad it turned out well for you!